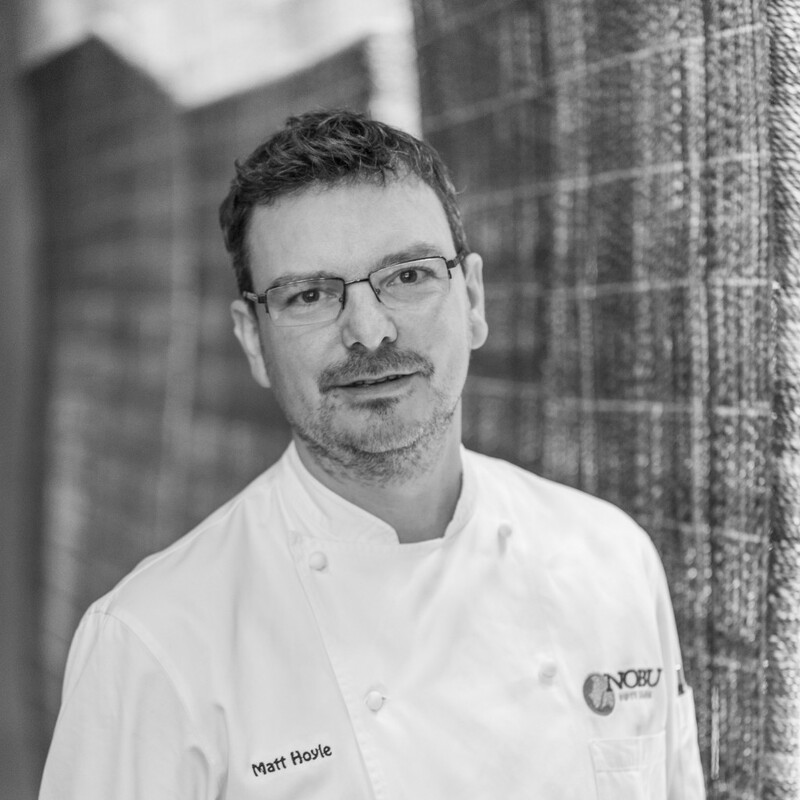 Matt Hoyle is the Executive Chef of Nobu 57 in New York, NY. Can you tell us about where you grew up and your food influences? I grew up in the Northwest of England, in Lancashire. My grandparents cooked much more traditional English food, like offal and pigs’ ears, pies and stuff like that, which my mother really didn’t like. She made more continental than English food, but when I became older, I would then see it in restaurants, and it’s become a big thing again. It sort of skipped a generation or two. We kind of forgot it and then had to rediscover it as a nation of cooks. How did you first get into cooking? After I finished school, I worked in two fish & chip shops in the town where I lived. I really liked food and cooking before that, but that was where I started to really enjoy the environment of cooking. Who do you consider mentors? 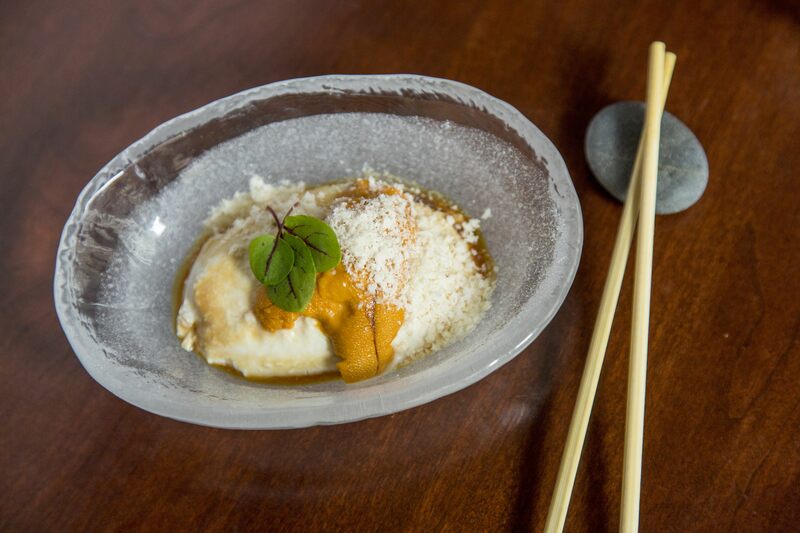 Obviously, Nobu-san has been a huge mentor, as well as Mark Edwards at Nobu London. Also, Terry Laybourne at 21 Queen Street in Newcastle. It was the only Michelin starred, fine dining restaurant in the northeast of England. I worked in his kitchen for three or four years, working and learning every section from larder to veg to sauce. What attracted you to Japanese cuisine? 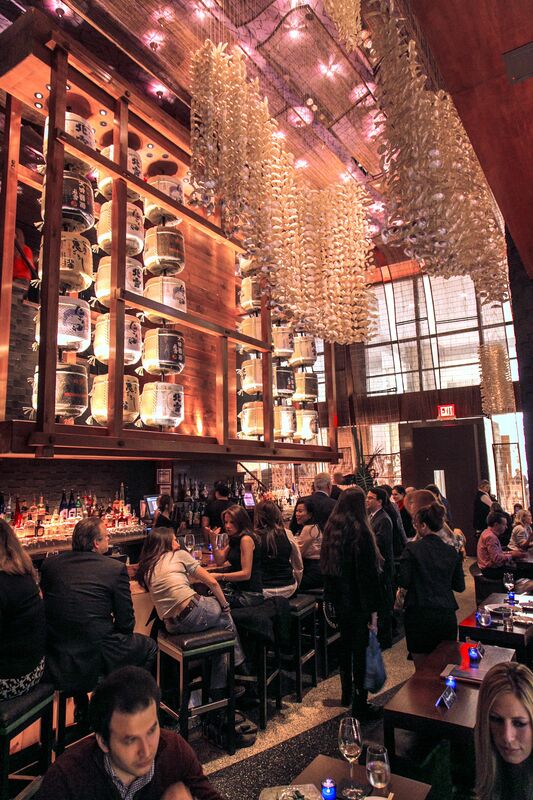 I knew very little about Japanese food before I started at Nobu. In the North of England, it just didn’t really exist. The simplicity of the food really excited me. The technique is very precise. Knowing exactly what you want, whether it’s how you cut fish or how you cook it. I loved the food and it really spoke to me. Also, the way the kitchens were run was just different. The way Mark Edwards ran the kitchen in London was so different than any other kitchens I’d worked in. He allowed us to have a voice rather than knocking us down. Are New York diners different than the diners in London? In general, London & New York are fairly similar cities. In New York though, you would have a full dining room and maybe two bottles of wine in the whole room at lunch time. In London, it’s more of a ‘let’s have another bottle before we go back to the office’. That European thing still exists there. The lunches are quite different. What are some of the more popular dishes at the restaurant? We sell a lot of Japanese Wagyu beef. The quality of the Wagyu has come back better than ever after it was banned for a few years. Vegetable dishes are becoming more and more popular in their own right, not just as side dishes. 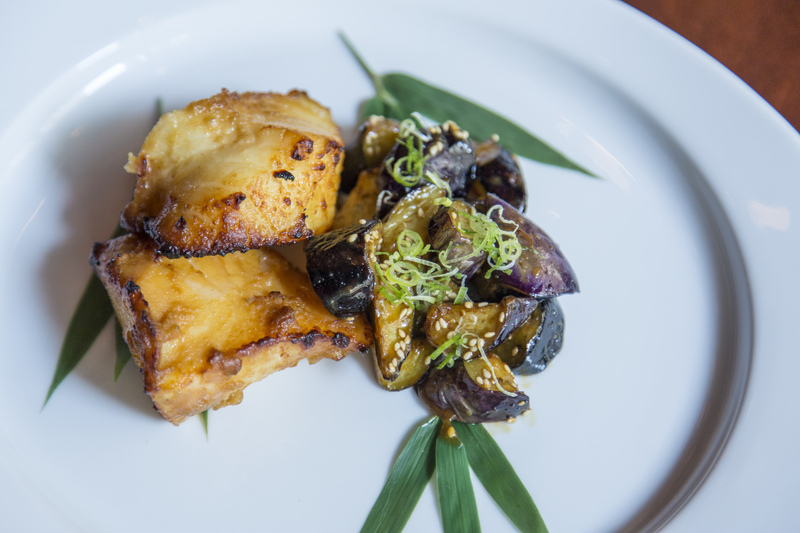 Black cod is obviously still a best seller. As a chef, what ingredients are you enjoying now? I’ve recently been enjoying some of the more fatty fish like mackerel, as well as shellfish – beautiful prawns and scallops that we get in the colder months. You always have to listen to what the customer wants, and use it to inspire you, to make both you and them happy. What are the essential tools you tell your new cooks they must have? A sharp knife. More of the cooks are using Japanese knives than they were eight years ago. I tell them they don’t need a full set, just start with one good chef’s knife. Learn how to sharpen it. What are your favorites tools in the kitchen? For myself, I love plating chopsticks, but I don’t expect the cooks to have them. For kitchen equipment, it’s the Rational oven. It’s kept the restaurant open a long time. When all my other ovens break down, it keeps going and you can cook very precisely or overnight. For young cooks starting out, what advice do you give them? You need a work ethic or you need to pick one up pretty soon. That’s essential. Favorite places to eat in NY? My wife is West African so we get a lot of West African food. There’s a place in Harlem called Ivoire, which is really good. For English pies, I like Harlem Shambles. They make Steak & Kidney, Cornish pasties, Aussie meat pies. For pork pies, Myers of Keswick is fantastic. They make everything in the back. My favorite for Japanese is Yakitori Totto. Chubo is excited to take you inside the workshops of knife craftsman in Sakai, Japan, who are still making knives completely by hand. 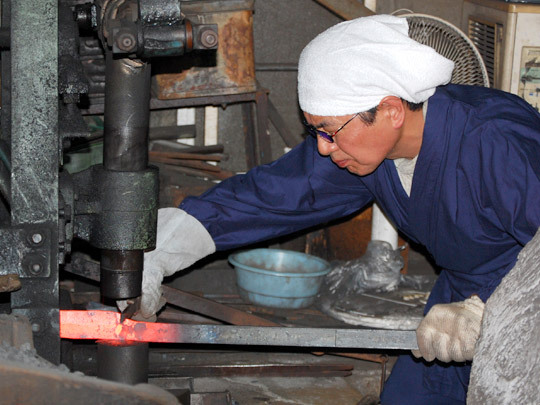 Each knife is forged and crafted in the tradition of generations of Japanese blacksmiths. 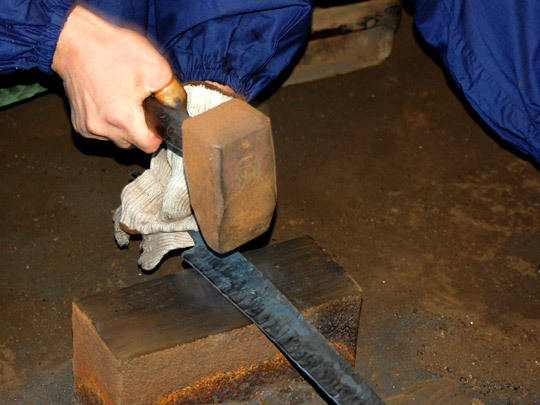 This is the second part of a two part series on the forging of these traditional knives. After completing the forging, hammering, shaping and tempering, each blade is ready to have its edge crafted. This is done by hand on a series of sharpening wheels, starting from rough grit, moving to medium grit and then on to fine grit. 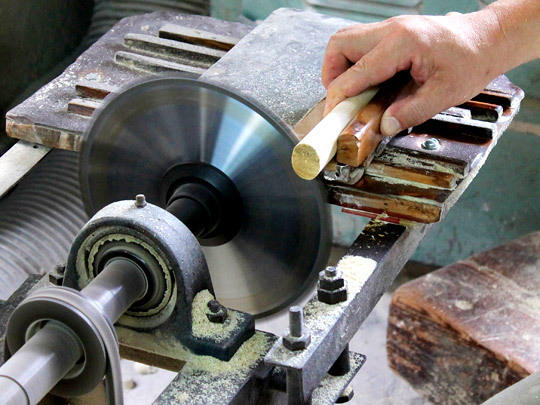 Each blade is then sharpened by hand on natural fine grit sharpening stones to refine and hone the edge and bring it to its desired sharpness. This is a delicate process that takes years to master. 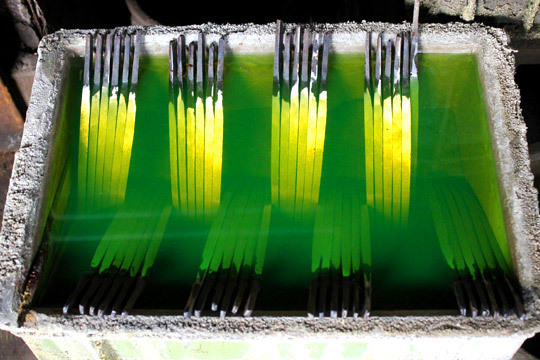 Knives are stored in anti-rusting liquid before the edge crafting process. Master Sharpener Oda checks the wheel for flatness. 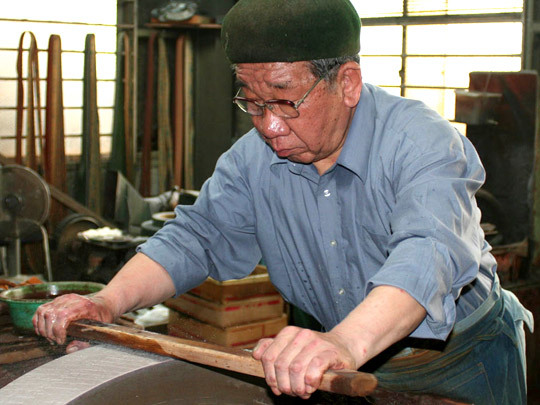 Master Sharpener Oda puts the final sharpening touches on a deba knife. The final step in the knife making process is attaching the handle. 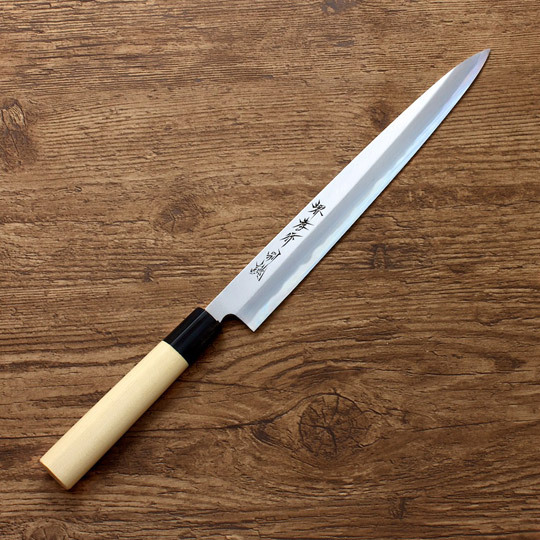 The handles on traditional knives are made out of high grade Japanese magnolia, a hardwood, that is light, difficult to crack and resistant to water. Each handle is cut to size depending on the knife and is bolster fitted with water buffalo horn. The last step is to heat the tang of the knife and insert and hammer into the handle. The craftsman cuts the magnolia handles to size. Each handle is fitted with a piece of water buffalo horn. The handle is attached to the knife and it is now ready to be used. Chubo is excited to take you inside the workshops of knife craftsman in Sakai, Japan, who are still making knives completely by hand. 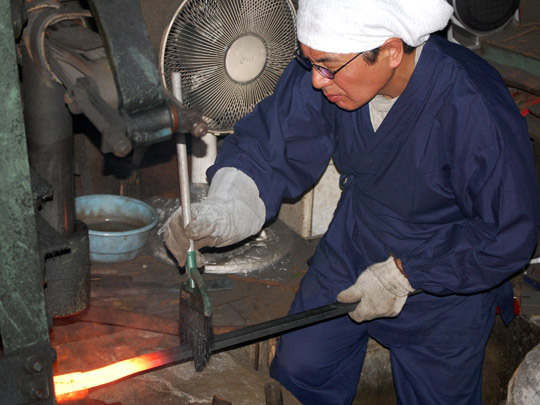 Each knife is forged and crafted in the tradition of generations of Japanese blacksmiths. This is the first of a two part series on the forging of these traditional knives. Traditional Japanese knives, such as yanagi, usuba and deba are handmade in a multi-step process by several craftsmen over a period of several days. 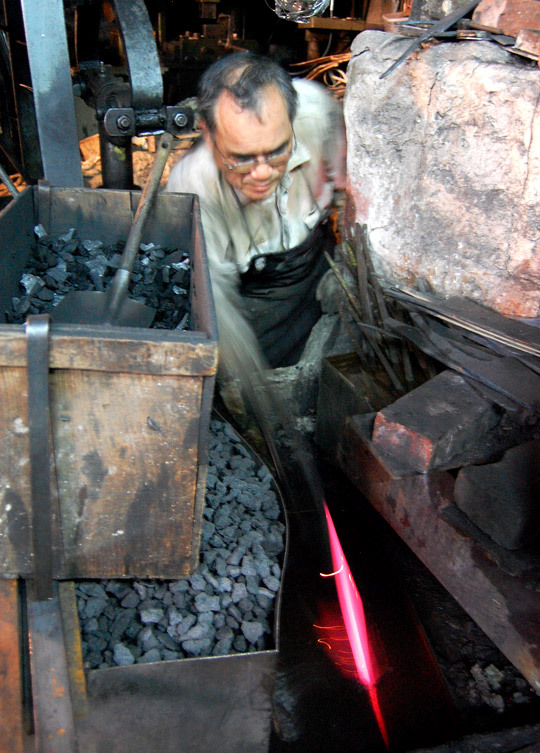 The first step in the process is forging the blade. 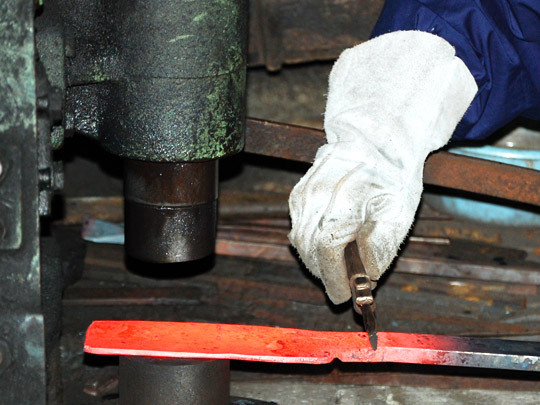 A piece of soft iron is joined to a piece of carbon steel and the blade is repeatedly forged, hammered and shaped. The high carbon steel will become the blade’s edge and the soft iron becomes the body and spine of the knife. Using the soft iron for the body and spine reduces brittleness and makes sharpening the knife easier for users. Craftsman Doi is joining the soft iron and carbon steel in preparation for hammering, forging and shaping the blade. 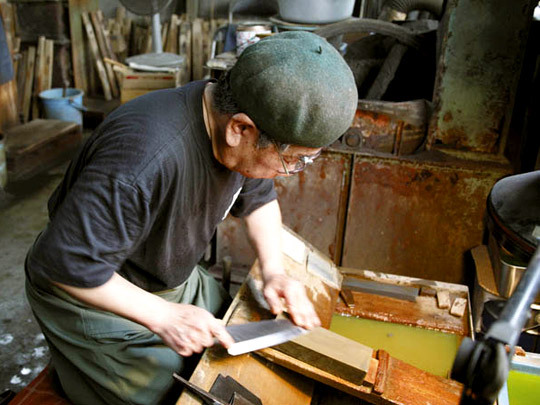 Craftsman Doi hand-shaping the blade gradually into its desired shape as an usuba knife. It is essential to brush the blade with a wire brush during the forging and shaping to keep the blade dust free. 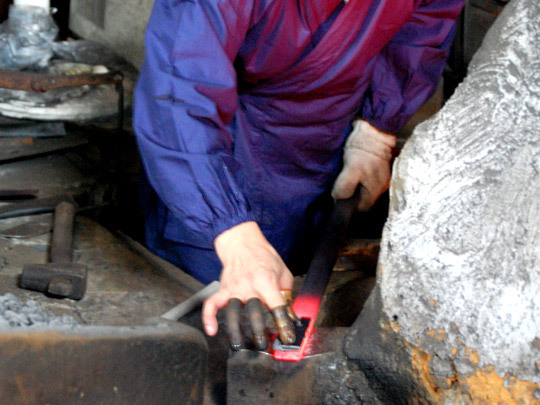 Craftsman Doi shaping an usuba knife. 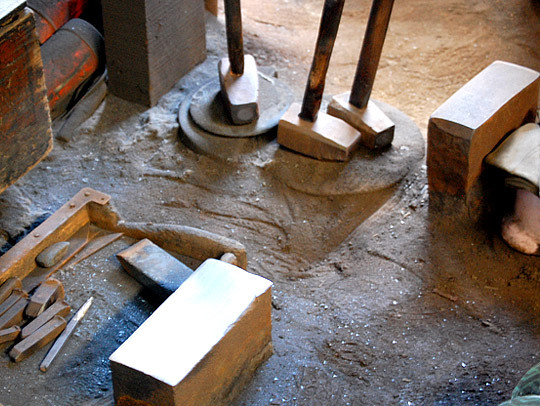 Many of the tools used in the shaping, hammering and forging process have not changed for centuries. Even with the most skilled blacksmiths, there are certain blades that don’t make the cut. These are discarded and recycled. 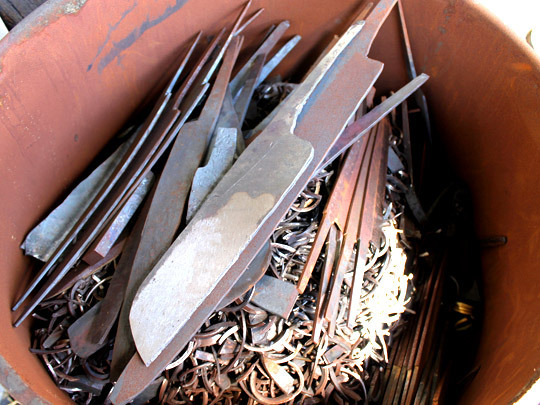 After each blade has been forged, shaped and cooled, it is hammered to further shape and strengthen the blade. After the hammering and forging, the blades are readied for the ‘yaki’ phase. The purpose of this process is to harden each blade to enable it to take on an edge. To prepare for yaki-ire, the furnace must be heated to precisely 720 degrees. This is judged and regulated completely by eye, based on the shade of red of the glowing coals. 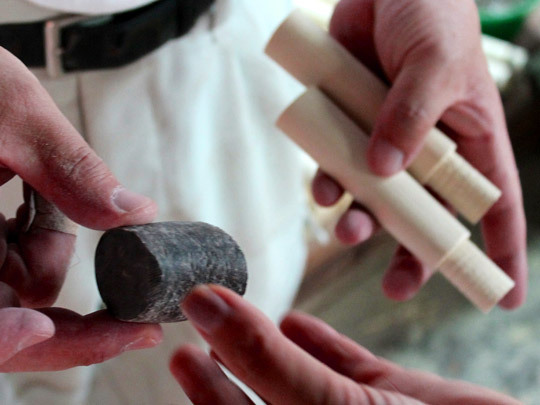 To prepare for yaki-ire, each knife is coated with clay to ensure even heating. 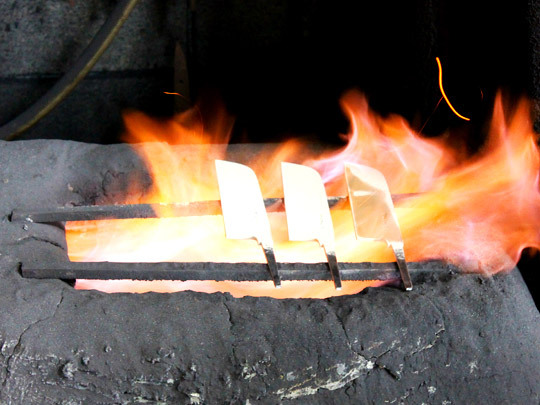 Each blade is heated, tempered and quenched in water to complete the process. 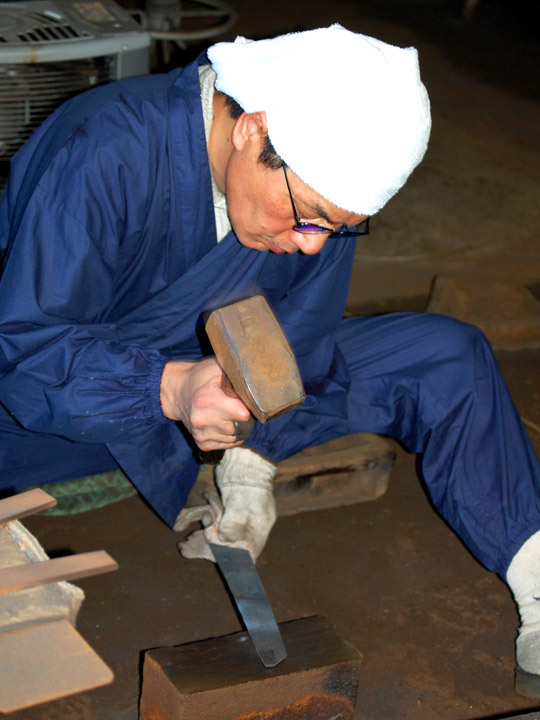 The process of yaki-ire is extremely difficult and takes many years for blacksmiths to master. Even master blacksmiths with decades of experience do not forge every blade perfectly and only a percentage of these blades make it to market. After removing the knife from the furnace, it is plunged in water to complete the ‘yaki-ire’ process. 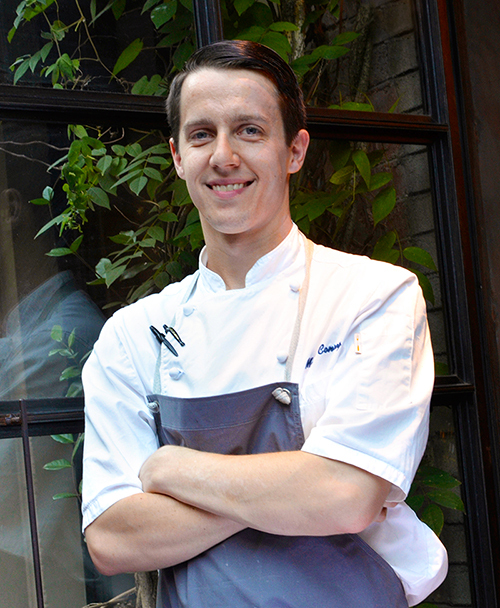 Matt Conroy is the Executive Chef at The Little Prince in Soho, New York. Tell us a little about how you got into cooking professionally. I grew up in Lawrence, Massachusetts, north of Boston. It wasn’t a really food focused upbringing, but my Grandfather was a good cook. He had ten kids and was good at making do with what he had. He made great soups and stews and when people would ask for recipes we’d laugh because he would just always say ‘to taste’. I got my first job in a kitchen when my neighbor, who worked at a diner, was looking for someone to crack eggs on the weekends and that’s how I ended up cooking. How did you end up working for Tony Maws? I first read about Craigie on Main in Food and Wine Magazine. It was a place I knew I wanted to work, but I didn’t have the experience necessary at that point, so I took a job in Vermont and really learned the basics and worked my way up to become a sous chef. We closed for six weeks every year and I used the time to go work for Tony for free. At the end of it, he offered me a job, but I went back to work one more season in Vermont before starting at Craigie. Working for Tony was the hardest year of my life. It’s one of the places where you hate it at the time and then you miss it for sure. I learned a lot about technique and discipline and attention to detail. Tony was always saying ‘Never compromise’ and that’s something I’ve taken to heart and try to instill in my cooks. How did you come to New York? I had done Boston, and New York was the logical next step. 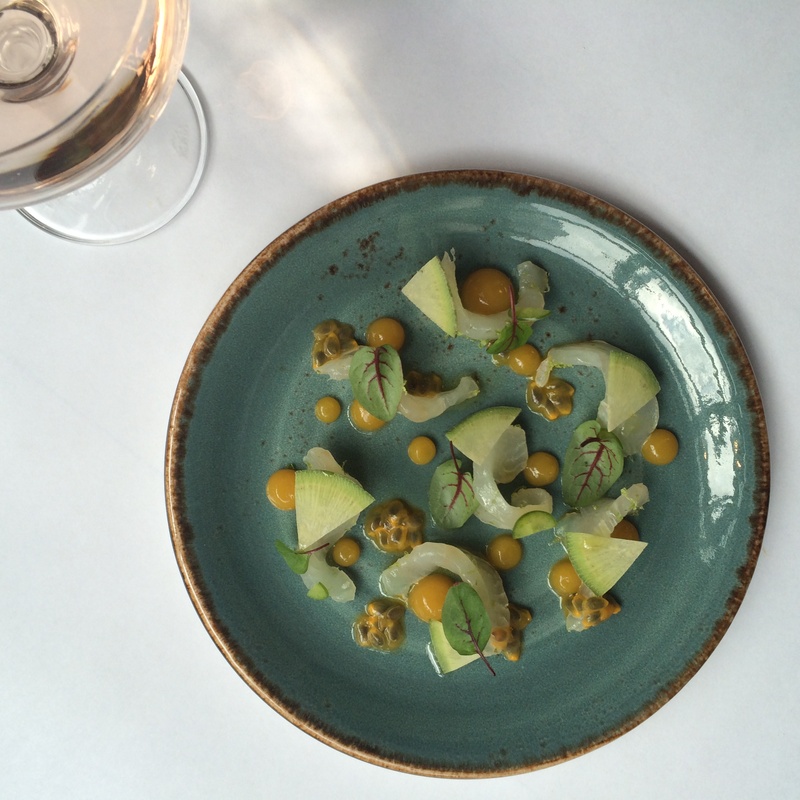 I knew Alex Stupak from connections in Boston and knew what he was doing in New York with Empellon. I was not interested in Mexican food, but I was interested in his style, so I came to New York to work for him. Alex’s plating is beautiful. I learned a lot, especially about attention to detail and plating, but it was also interesting to see how a [trained] pastry chef approaches a dish. I also learned a lot about chilies, which don’t factor a lot into French cuisine, but I know I can go for a chipotle chile, when I want to add smokiness to a dish, without a lot heat. 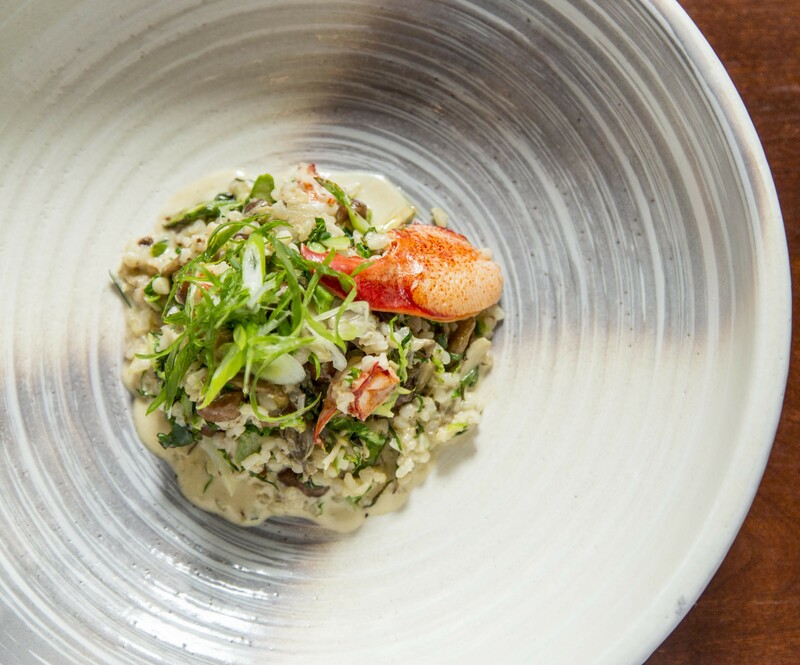 How would you describe the food at Little Prince? 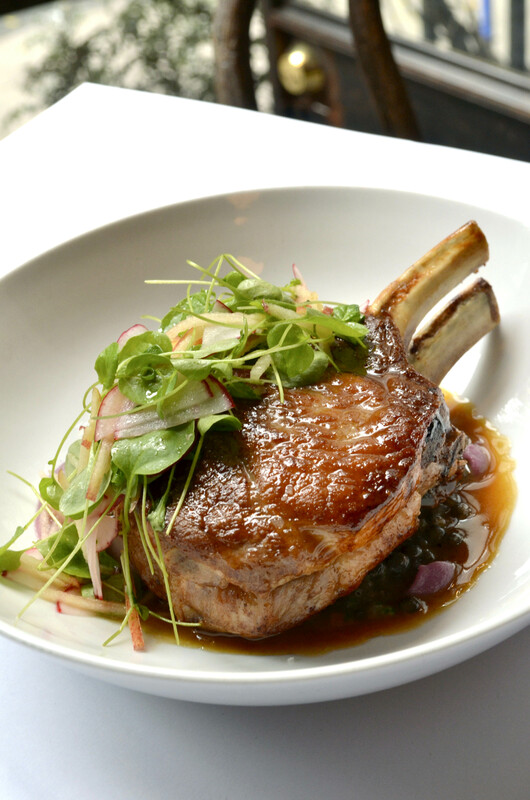 We’re definitely a French Bistro at heart, but we don’t limit ourselves to traditional ingredients. I get inspired by what’s fresh in the market, and try to use the whole animal as much as possible. With chickens, it’s usually paté from the liver and stock from the feet. I feel strongly that nothing should go to waste. In November we started a Sunday Supper Series as a chance for me and my sous chef to be creative. 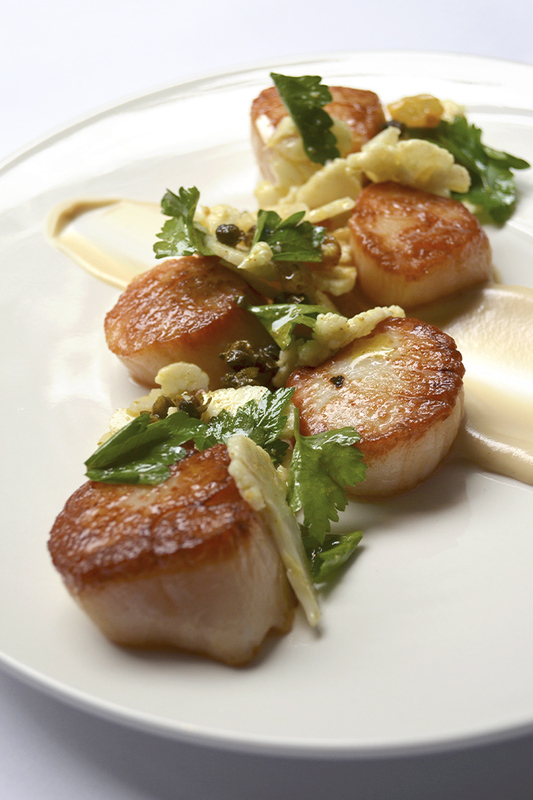 It pushes us to put our heads down and create new dishes. Sometimes they make it onto the menu. Recently, we started with the goal of creating a vegetable focused starter and came up with a dish of roasted carrots and burnt vinegar honey. It was really well received and stayed on the menu. Salt Cod is an ingredient I’ve been playing with a lot. It’s very traditional French, and it can seem boring, but it can also be interesting. For a recent dish, I started with a salt cod fritter and at the end of the day, sea urchin is really eggs, so I created an aioli out of it. A sharp knife is one I have to have. And you don’t have a sharp knife without those stones. Also, I always keep a pepper mill at my station and a Kunz’s spoon for basting, saucing and tasting. Who have your mentors been? Aside from Tony Maws and Alex Stupak, Rogan Lechthaler of Downtown Grocery in Ludlow, Vermont taught me a lot about charcuterie. I think he runs a great kitchen and was the first chef I worked for who focused on using local products. Being in Vermont we used lots of great local farms. Favorite places to eat and drink in New York? I live in Brooklyn, and on my day off I usually go around the corner to a Mexican place Antojitos Mexicanos and get a torta. I’ve been to Estela twice, which is rare since there are so many restaurants in New York City. I feel the menu is really suited to a cook’s taste. The food is really well balanced with just enough salt and acidity. I also like Roberta’s a lot. I know I can always get a great pizza and some really interesting appetizers. In my hometown, there’s a place call Harrison’s Roast Beef. It’s a simple sandwich of house roasted beef, with cheese and some special sauce, but every time I go back I want one of those.